Classified as a light duck breed and originally named the 'Hooded Ranger' duck, the Abacot Ranger was developed by Oscar Grey of Friday Wood near Colchester, Essex, UK. This was sometime between 1917 and 1923 – his premises were named Abacot. Laying ducks were popular at this time and the race was on to produce a good egg layer that could also be used as a table bird. With the high egg laying Indian Runner ducks and the dual-purpose but very high laying Khaki Campbell, breeders could see that it could be done. As planned, and by using both Indian Runners and Khaki Campbell in its development, a useful and active duck was produced and was popular in the UK until about the 1920s. Luckily it had been standardized in Germany in 1934 as the Streicher-Ente (Ranger duck) where it did very well. In 1980, a resurgence of waterfowl occurred and keen fanciers imported eggs back into the UK and now the breed is being kept increasingly in the UK. It is a very good egg layer and does indeed make a good carcase but it is probably kept as much for it's beauty. The green hood of the male contrasts with the rich red brown of his flanks and breast and his silver neck circle completes an attractive picture. More demure, the light brown streaks against a cream breast and brown head is the duck's plumage and as they are different in appearance, it is easy to tell the drakes from the ducks by about eight weeks of age. Breeders were aiming for a bird that would go out and forage for at least a proportion of their own food and the Abacot Ranger is a perfect example. Don't put it in a small run but give it space, orchards are particularly good if protected from foxes. Feed it of course but it will also like to forage for invertebrates and plant material and will be busy all day long. It's an excellent mother and a tight sitter. It is not a good flier. Allow it into the autumn garden (after veg have been harvested) and it will clear slugs and snails). 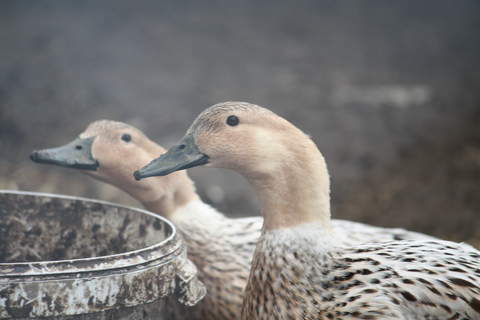 Light breed classification - drake and duck are different colours but there are no other varieties of colour.